Ethylene glycol is a widely used chemical that is capable of causing significant injury if ingested. 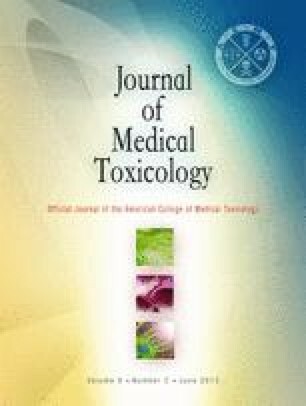 Treatment for ethylene glycol poisoning typically includes basic supportive care, alcohol dehydrogenase inhibition, and hemodialysis. Recent data have suggested that hemodialysis may not be necessary for cases of ethylene glycol poisoning that can be treated with fomepizole as blocking therapy before acidosis or renal dysfunction develops. A 33-year-old man presented to the emergency department 1 hour after drinking approximately 1/2 gallon of ethylene glycol antifreeze and an unknown quantity of beer. On arrival he was mildly inebriated but otherwise displayed no other features of ethylene glycol poisoning. Fomepizole therapy was initiated and initial laboratory studies later revealed an osmol gap of 157 mOsm and an ethylene glycol concentration of 706 mg/dL. Nephrology and toxicology services were consulted. Over the next 3 days, fomepizole therapy was continued while the patient’s acid-base status and renal function were closely monitored. No evidence of acid-base abnormalities or renal impairment was ever observed and the patient was discharged to psychiatric care on the fourth hospital day. This report describes the case of a patient who presented soon after a massive ingestion of ethylene glycol with very high serum concentrations. He was successfully treated using fomepizole and basic supportive care. Our patient developed neither renal insufficiency nor metabolic acidosis. His concomitant ethanol consumption, early presentation, and treatment likely contributed to his favorable outcome. This case report underscores the effectiveness of supportive care and fomepizole in the treatment of ethylene glycol poisoning. There was no outside funding of any kind for this study.